Automatic drip coffee makers are likely one of the most common kitchen appliances found in every household today. They are quick, convenient, hands-off, and can handle both large and small batches of coffee in most cases. 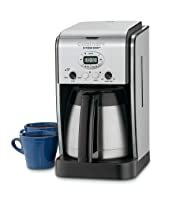 Automatic drip coffee makers are also known for their long lists of features that may include anything from a programmable brew timer to a “strength selector”. If you value convenience over craft, an automatic drip coffee maker is probably the way to go. There is nothing like the smell of freshly brewed coffee in the morning, the rich ground coffee beans mixed with hot water at just the right temperature makes the perfect beverage to wake you up in the morning. But if you are still drinking instant coffee, or you would like to update your old coffee machine to enjoy your own perfectly brewed coffee at home, why not invest in the best automatic drip coffee maker? In this article, we will take a look at some advanced features and properties of the best automatic drip coffee makers. It’s missing an audible alarm to tell you when coffee is ready. The coffee’s heat drops substantially while the glass carafe sits on the warming plate. This coffee maker is a bit finicky to program, but the resulting coffee brewed are excellent. The KRUPS coffee maker can produce a maximum of 10 cups of tasty coffee or, if you prefer, just one to four cups if you do not need so much java. This streamlined coffee maker features a large LCD display that you can watch as you program the device, and you can see the water level through a clear indicator. This medium-sized coffee maker is made of brushed stainless steel and black plastic. It includes a built-in water filter to help improve the flavor and smell of any tap water you might use to brew. For the brewing process, you can either make use of the gold mesh permanent filter that comes with it or use paper filters if that is what you prefer. The brew basket is cone shaped, which a number of coffee fans insist makes a better-tasting pot of coffee since the water and grounds are compressed by gravity into the bottom of the brew basket to extract the fullest flavor from the grounds. The thermal carafe does a good job of keeping hot coffee hot. It’s pretty tall, so it might not work if you have low-hanging kitchen cabinets. This one was not the favorite for flavor in our taste test, but it is packed with features to make your life easier. The Cuisinart 4-Cup Programmable Thermal Coffeemaker offers convenient features that make your morning routine go more smoothly, but was not the favorite for flavor and aroma among our testers. They scored it a little below the best coffee makers. However, tastes are subjective, and you may – through trial and error – find a way to get the best cup of coffee out of this machine. It might be worth the effort to get access to all of the convenient features this Cuisinart coffee maker has. One noticeable convenience is the bright LED screen that makes it clear what is going on with your machine at all times. Also, it is programmable so you can set a brew time up to 24 hours in advance. You can control how strong you want your coffee through the control panel, and there is an alarm to let you know when the coffee is ready, which can be turned off if you prefer. There is even an indicator light that lets you know when it is time to decalcify your carafe. The coffee tastes a bit weak. 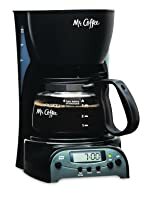 The Mr. Coffee FTX presents more adjustable features than most Mr. Coffee machines so you have more choices as far as warming plate temperature and coffee strength, but the coffee flavor is rather drab. Mr. Coffee has been a staple in American households since the 1970s and has an extensive market of loyal customers. The affordable Mr. Coffee FTX is a versatile drip coffee maker that presents several types of settings and fixtures so you can adjust a number of features that affect your coffee. However, our taste-testing panel was unimpressed with the flavor and they all considered the coffee to be weak. This 4-cup coffee maker requires a paper filter in its brew basket and a glass carafe that is shaped like an inverted cone. The neck is considerably narrower at the top than the rest of the carafe, but it is still large enough that you can get your hand inside to clean the bottom and interior sides of the pot without any trouble. The mouth of the carafe is nicely designed to avoid messy drips as you pour. The Cuisinart DC-2750 is equipped with re-engineered brewing technology to deliver a fresh pot of coffee up to 25% faster than comparable machines. This model has a large showerhead to evenly distribute hot water over coffee grounds for flavorful, aromatic drinks. If you prefer to brew smaller volumes of coffee, there is a 1-4 cup setting that will automatically adjust the brewing cycle to maximize flavor and guard against under-extracted brews. For custom drinks, the Extreme Brew comes equipped with two coffee strength options, allowing you to prepare regular or bold beverages. The DCC-2750 also has a 60-second reset that will automatically recall your settings and preferences in the event of a power outage. The Extreme Brew features 24-hour programmability. This coffee maker can be set to automatically come on and brew up to a day in advance. While the Extreme Brew is equipped with audible alerts to let you know when the brew cycle is complete, you have the option of muting the sound if you prefer not to be disturbed. With Cuisinart’s Brew Pause Feature, you can interrupt the brewing cycle to sneak a quick cup of coffee. Once you’re done pouring your cup, the machine can resume the brewing cycle where it left off. You get few convenience features on this drip coffee maker. You might not get much programming versatility. You might not get much programming versatility with the Hamilton Beach coffee maker, but you can brew potent and flavorful coffee. This Hamilton Beach 2-Way Brewer is a programmable coffee maker that offers you dual capabilities: on one side you can brew a 12-cup pot of coffee, and on the other side you can separately brew either a single cup or a travel mug of coffee to go. The single-serve side of the machine comes with a mesh filter for coffee grounds, or you can use soft pods of pre-packaged ground coffee. The single-side portion of this drip coffee maker comes with a mesh brew basket filter that you can use as a measuring scoop if you prefer that to pods. You can place a plastic cup rest underneath the single-side dispenser to hoist a cup up high enough so that coffee flows into it and does not make a mess. Otherwise, there is room enough for a 14-ounce travel mug. The mug is an extra accessory that you must buy separately. The carafe side uses paper coffee filters in its basket. There are adequate options available that anyone can find the best automatic coffee maker that suits their needs. With proper planning and evaluation, you can find the best coffee maker and can achieve a success and glory of brewed cup of coffee. When you look upon the types the next big thing which you will come across is size or capacity. Capacity is the amount of storage and the fills. You must have to see the water capacity it can hold and how many cups it can make at a time if it’s a single cup then pod machines like CBTL are perfect but if not then you need to see the quantity it derives. Many machines can make 12 cups on a go and some less so by knowing the perfect capacity you can have the best you want. Programmable clock which will enables daily start time. Water level indicator so that you do not have to bother about water. Auto clean because many seriously don’t time to perform such action of cleaning the machine. Like we discussed above, the price range is directly proportional to the features of coffee maker. The main point of difference between upper and lower range are integrated features; the more features pricier and vice-versa. Most manufacturers in our coffee maker reviews provide telephone and email support. The warranty periods for automatic drip coffee makers range from one to five years, which is quite a range, so be aware of the warranty period as you make your selection. Accessories (Thermal Carafe, Pods and Filters etc.). From the brands, features, price, customer feedbacks and comments from active users and buyers, we found KRUPS KM785D50? to be the first choice.? Since we are looking for the best automatic coffee maker it is important to see how far a coffee maker can go in the longer run. However, Brother Cuisinart 3200 will be the secondary choice considering the close competition with the first product in terms of the functions and features.